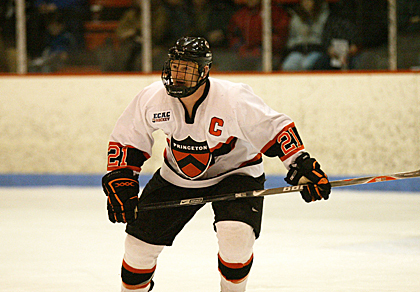 MOORE SUCCESSFUL: Princeton University mens hockey senior captain Mike Moore heads up the ice last weekend in Prince-tons best-of-three ECAC Hockey quarterfinal series against visiting Yale. Last Sunday, defenseman Moore contributed an assist as second-seeded Prince-ton blanked seventh-seeded Yale 4-0 to win the decisive Game 3 and earn a trip to the ECACH semifinals. The Tigers, now 19-13, face eighth-seeded Colgate on March 21 at the Times Union Center in Albany, N.Y. in one semi with third-seeded Harvard playing fifth seed Cornell in the other. The winners will play in the title game the next night.